Early childhood education is one of the touchstones not only of your children’s education, but their development as well. Why? Well, it will help them to develop things that will always be helpful in life such as creativity, cognitive development, and their imagination. Arr, mateys. Time to take that ship over there. Okay, great job, now time to color your pirate ships. Make sure you put your name on it too. Wait, what? Well, this is an example of creative play. Give the children some safe plastic toy swords, a few eye patches here and there, and instead of a preschool class, you have two pirate crews. Or maybe some children can be flowers and the others bees and butterflies. As you see, there are lots of ways to stimulate the imagination of your children. Why does this matter? Well, a strong imagination encourages out of the box thinking later on in life. With an imagination of what could be, it allows children the ability to find ingenious solutions to problems. This is one of the first steps towards creativity. Creativity is more than just finger paints, though you’d be surprised to know that something so simple can have a big difference in a child’s life. If they are encouraged to be creative, and to learn to express themselves creatively, it will help them psychologically. A lot of experts in the world are seeing a big spike in other development areas simply by being creative. Music programs at schools are directly linked to someone doing well in mathematics for example. A daycare center that encourages time to be creative sets a child up to be creative at other times in their lives. All of this is crucial towards developing your child’s imagination. An imagination is one of the key factors to critical thinking. Speaking of critical thinking, what about cognitive development? Cognitive development allows children to start learning at an even faster pace. The more their minds develop, the more they will be able to master such vital life skills as literacy, mathematics, and study habits. The more mentally developed a child is, the easier a time he or she will have in school. So, imagination, check. Creativity, check. Cognitive development, check. 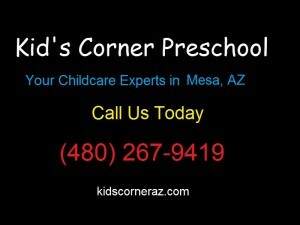 All these reasons and more are reasons to pick the right preschool in Mesa.